Teams working through The Three Ways need an unbiased way to judge their progress. That is, how do you know "Are we there yet?" Like any journey there are milestones. I call these "look-for's". As in, these are the things to "look for" to help you determine how a group is proceeding on their journey. 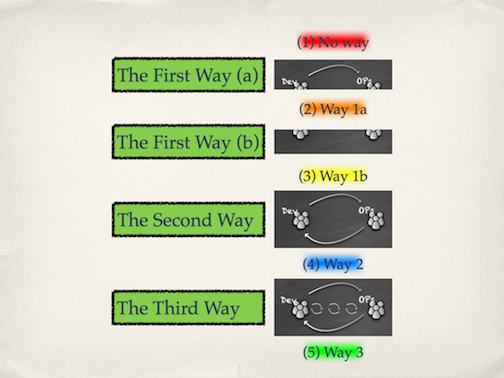 Since there are 3 "ways" one would expect there to be 4 milestones, the "starting off point" plus a milestone marking the completion of each "Way". I add an additional milestone part way through The First Way. There is an obvious sequence point in the middle of The First Way where a team goes from total chaos to managed chaos. A co-worker watched me type the other day and noticed that I use certain Unix commands for purposes other than they are intended. Yes, I abuse Unix commands. An iMac at work broke and AppleCare gave us the choice of bringing it to one of three places in the local area, or the local AppleStore. Since one of those choices was the CompUSA around the block from us, my co-worker brought it there. And waited. And waited. And was told they were waiting for the part. We called the Apple store who said that they could do most repairs in 24 hours. The question was, "How do we get it back?"